John Krasinski, the man behind Jim from The Office, is down to play Mr. Fantastic in a new Fantastic Four movie. 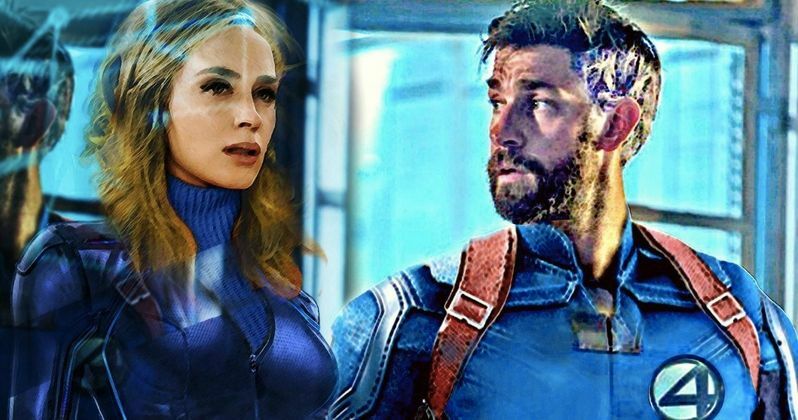 Krasinski has flirted with the superhero genre in the past, having been up for the role of Steve Rogers in 2011's Captain America: The First Avenger, a role that would ultimately go to, and define the career of Chris Evans. However, if the Fantastic Four ever gets a reboot (which it almost certainly will) Krasinski is down to play Mr. Fantastic, with his real-life wife Emily Blunt as the Invisible Woman by his side. This came up during a recent interview that John Krasinski was doing for his new movie A Quiet Place, which, in addition to starring in alongside Emily Blunt, he also directs. So far, the movie is getting rave reviews. Given that some have suggested him for the part of Mr. Fantastic and, since he stars with his wife in the new movie, he was asked about playing the part, with Blunt taking on the role of Sue Storm, to his potential Reed Richards. Here's what he had to say about it. "Oh yeah, the Fantastic Four. I would love that! I mean listen, I'm still getting into the whole superhero thing. I didn't read comics as a kid, not as many, I read some but not as much, but I'm a huge superhero fan so yeah, I'd love to do something like that. If there are any left, a lot of these have been taken but the ones that are left, yeah, I would love to do something like that. And listen, I'd love to work with her again so any chance I got would be great." Many of the high-profile superhero properties are spoken for at the moment, there's no denying that. But given the tremendous failure of 2015's Fantastic Four reboot, that's one of the few truly marquee comic book titles out there just waiting for a good adaptation. The idea of John Krasinski playing Mr. Fantastic partially got going as the result of some fan art that was floating around online, which you can see for yourself below, depicting him as the famed hero. The response from fans was overwhelmingly positive. As for the Emily Blunt bit of this? She actually has flirted with the world of Marvel over the years. She turned down major roles in the form of Black Widow in Iron Man 2 and Peggy Carter in Captain America: The First Avenger. She was rumored to be up for the role of Captain Marvel as well, but the actress has denied that there was any legitimacy to that buzz. In any event, she seems destined to land a role in one of these movies at some point and she would make a fine Sue Storm. Currently, Fox controls the rights to the Fantastic Four franchise. However, Disney is currently in the process of purchasing most of 21st Century Fox, pending approval from regulators. When and if the deal goes through, Disney, and therefore Marvel Studios, will be in charge of the franchise. At that time, it seems very likely we'll see a reboot. If so, it looks like they have a solid candidate for the role of Mr. Fantastic. Who knows? Maybe they could even get John Krasinski to direct it, given the response to A Quiet Place so far. This news comes to us courtesy of Screen Rant.